Welcome to... The Location History Beta! You can now see at your device's past locations using the Location History view. It will show help you follow your phones, tablets, and laptop's activity throughout the day, hour by hour. Make sure your account's Aware Tracking settings under the Device Management menu in Settings are turned ON for Prey to gather additional locations for the history to show. DISCLAIMER: This feature is currently available as a Beta functionality, free for all our users. With the feature's development, the tool will transition to be part of our paid plans programme. Log into the Online Panel at our website, and click on the device you're interested in. There you will see in the map that the pin with your device's last location now has a link which reads 'Show previous locations'. Click it to access the Location History view. Let's take a quick look into the tool and clear all doubts! 1. By default, the view displays the current date, you can select another date on the calendar. If there is no location available to see on that day, we will suggest the latest date in which we have recorded movements. 2. The points in the map represent places your device has been, and how many times it visited said spot. 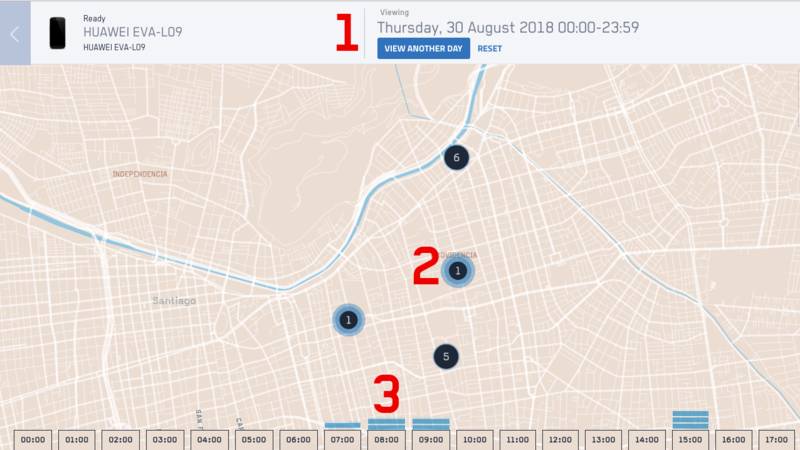 If you click the specific point you will see each specific time at which the device visited that place. 3. The lower bar shows your device's activity by hour. This way you can see in which moment of the day your device moved the most, and if you click on that hour you can filter the view to see the specific points linked to that hour.